Just when we started to recover from Prince Harry and Meghan Markle's whirlwind summer, the Duchess of Sussex headlined an event promoting Together: Our Community Cookbook by Hubb Community Kitchen (with a foreword by HRH herself!). 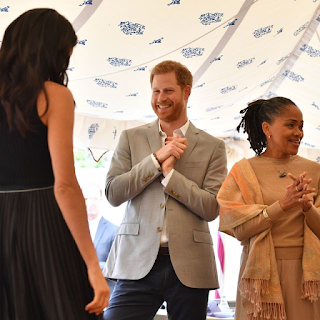 Meghan was joined by her husband and mother, Doria Ragland, at the book's launch party. Yep, that means we caught our first glimpse of Meghan with the two most important people in her life. Cue the body language analysis. In this case, the celebration was all about Meghan and the women of the Hubb Community Kitchen (as it should be). 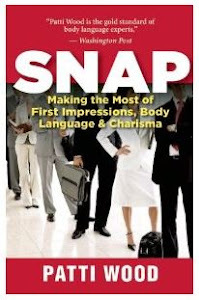 "For the first time ever, Meghan and Harry didn't make each other their priority," Patti Wood, body language expert and author of SNAP: Making the Most of First Impressions, Body Language, and Charisma told GoodHousekeeping.com. 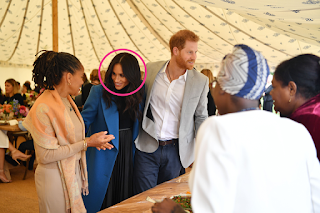 But it's not what you think: "It's clear Harry prioritized his wife and mother-in-law, since they were the guests of honor and he was simply there as a cheerleader." You could spot the difference as soon as the trio got out of the car. Unlike previous engagements, Meghan didn't wait for Harry. Instead, she walked with her mother and let Harry follow — and he looked happy doing so. "Despite this difference, he's at ease," explained Wood. "In fact, there's still a playful nature about him." While he clapped, cheered, and grinned during the entitreity of the event, his finest moment came after a big gust of wind ~ruined~ (read: momentarily messed with) his wife's hair. Impossible, no? Wood told us that this movement had a deeper meaning: "This was Prince Harry's way of telling his wife, 'I'm here.' There's a child-like sweetness to this simple gesture, which indicates that he's not bothered by taking a backseat for the day." So, ya think that's sweet? Well, Meghan and Harry both twisted their wedding rings during Meghan's speech as pointed out by Susan Constantine, human behavioral expert and author of The Complete Idiot's Guide to Reading Body Language. "This has different meanings depending on the environment. In this case, it's likely because their husband or wife is foremost on the mind," Constantine told us. That's what love looks like. Or a not-so-subtle nervous tick. We'll go with the former. While this event was undoubtedly a big day for the Duchess, it was also the first time that her mom, a yoga instructor and social worker, tagged along for a royal engagement. "You could sense their nerves," Constantine said. "Every now and again, Meghan would take quick glances to check on her mother, which indicates that she was distracted by the newness of it all." WHICH. MAKES. TOTAL. SENSE. One thing's clear: Meghan is her mother's daughter. "When speaking, both women would talk with their palms up and fingers open, which symbolizes honesty, collaboration, and feedback," Constantine explained. Now, that's an appropriate feeling for an event celebrating a cookbook about — you guessed it — collaboration. Point blank: If this was a different event, the experts would have different feelings. This particular instance, however, was about Meghan and Doria. Sure, it's odd to see the couple apart from one another (no back rubs, Meghan?) but given the fact that the event was about a cookbook — not the couple — it makes perfect sense. And can't we all agree that it's pretty incredible to see Prince Harry sit back and watch his wife in amazement. Don't mind us still swooning over here.